Windmill palm tree is one of the most adaptable palms you can grow. This tree is a giant in its native habitat, but only reaches 6-8 ft when grown in a container indoors. Slow-growing, it will take this indoor palm plant several years to reach this height. The whorl of fan-shaped fronds make it a stunning decorative accent tree. Young fronds have pleated leaflets that gradually open into widely spaced fans. As the palm grows, it develops a thick trunk which is covered with coarse brown fibers. Shed some light. Give this palm as much light as you can. Move it outdoors for the summer, if you want. Just be sure to keep it protected from strong winds, which can damage the fronds. A sheltered porch or patio is ideal. Repot in spring every 2-3 years or as needed, moving it to a pot 1 size larger. 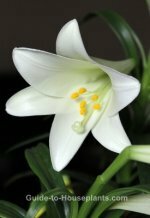 Older plants that are too big to repot can be top-dressed instead by replacing the top couple inches of soil. Crowding roots helps to control its size. Use a heavy container to prevent it from toppling because this palm gets top-heavy. Brown leaf tips are often caused by sporadic watering, low humidity or a build-up of chemicals in tap water and fertilizers. It's a good idea to water palms with distilled, filtered or rain water. Palms are sensitive to fluoride and chlorine often found in tap water, and salts from fertilizer. You can get rid of these impurities in the soil by flushing the container. It's easy to do: Pour lots of water over the soil so that the water comes out the drainage holes. Repeat the process a couple more times, then empty the drainage tray. Buying a palm? Windmill Palm Tree sometimes goes by the common names Chusan Palm or Fortune Palm. 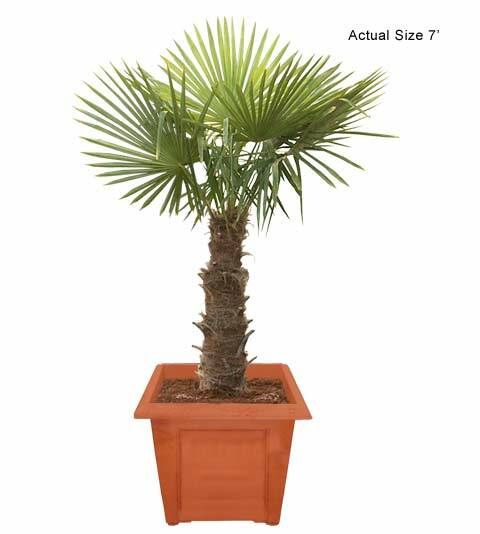 Look for the botanical name Trachycarpus fortunei to be sure you're getting this indoor palm plant. Light: Bright light with plenty of direct sun. Moving your palm outdoors? Make the move a gradual one. 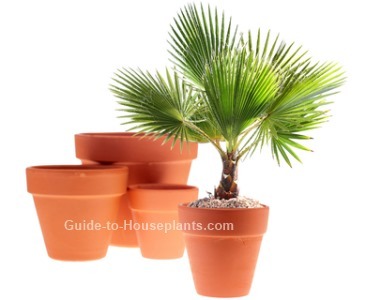 Palms that go into hot, direct summer sun then back to indirect light indoors may drop their leaflets. Humidity: Moderate (at least 50% relative humidity). Dry air will cause the tips of the leaflets to turn brown and crispy. Mist your palm regularly or use a room humidifier to add moisture to the air around it. Temperature: Average room temperature 65-75°F/18-24°C year-round. This is one of the few "indoor palms" that can tolerate cold. Windmill palm loves warmth, but will tolerate a minimum of 40°F/4°C. Soil: Use a peaty mix that drains well. Mix 1 part sand to 3 parts African violet potting mix. Propagation: Plants can be grown from seeds, but seedlings are slow-growing and you'll wait several years for them to grow into trees.